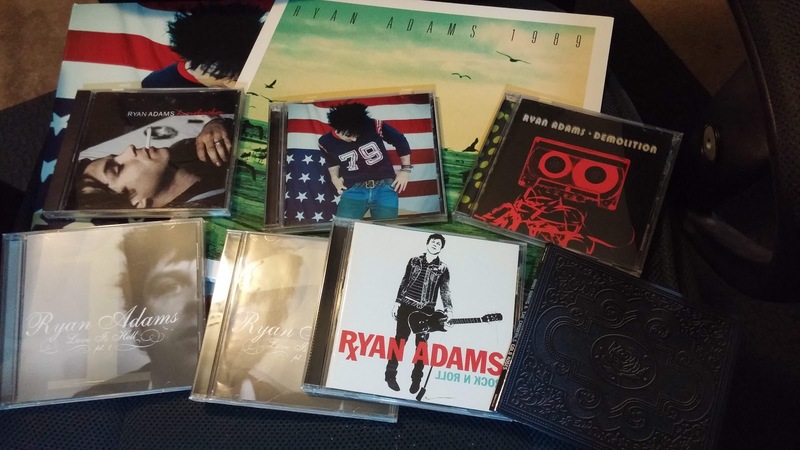 There was a time when I listened to Ryan Adams' music practically all the time. Back in 2001, as I finished college and tried to navigate post-college life, the double dose of Whiskeytown’s Pneumonia and Adams’ Gold led me to everything else he had made before. It was countrified rock music that spoke to me in a deep way, mainly on the musical front. As it turned out, there was a pattern in my life: if I had a little taste of a feeling of sadness or anger, I could relate to those who had it much worse than me. I thought of it as coping, “You’re not alone in feeling this way” sort of thing. Almost every release Adams put out between 2001 and 2005 -- mainly Demolition, Love Is Hell parts 1 and 2, and Rock N Roll -- were in regular rotation in my car. Driving around during seven-day work weeks, shows, and band practices, practically anything Adams did was a major fixture, along with everything else I listened to, from Chicago to Ben Folds to face to face. Yet after I listened to Cold Roses a number of times, my desire to hear more of his new music suddenly came to a halt. I knew there would be two more albums released in 2005, but something changed in me where I didn’t want to hear everything he released. I didn’t hate Cold Roses, but I wasn’t really onboard with what I thought was more of the same with Jacksonville City Nights and 29. From then on, I would occasionally hear a post-2005 tune or two that I really liked, but for the most part, Adams didn’t make music that connected with me anymore. Aside from his cover version of Taylor Swift’s 1989, nothing really made me want to spend a lot of time with the plethora of material he had put out since Cold Roses. I knew plenty of people who praised albums like Prisoner, Ashes & Fire, and Easy Tiger, but I could not find the same joy they had. Seemingly out of nowhere last week, Adams was the subject of a damning portrait in the NY Times. Heavily-researched and backed up -- mixed with various denials by Adams through his lawyer -- there were many allegations from multiple women about his treatment of them. Like a lot of articles written about people who have repeatedly misused power with inappropriate behavior, I lean towards believing accusers who have nothing to gain by coming forward. Once the allegations were made public, it was understandable to declare that Adams hid in plain sight, as an article in Jezebel laid out. In my eyes, as someone that heard more about his erratic, oftentimes childish, behavior than his new records, I never thought he was that toxic. Yes, I believed that knowing about that angry voicemail he left for Jim DeRogatis, his rather short-lived feud with Power Trip, how he treated people who used flash photography during his live shows, and throwing out a fan who requested a Bryan Adams song at a show. I knew he had a reputation, but not one that made the lines between his music and personality make me feel uncomfortable about liking what he produced. Therein lies the way things tend to go with not believing what you hear. You hear bad things about somebody for years, but they tend to be passed off, based on debatable severity. The really damaging -- potentially libelous and/or criminal -- tends to be very hard to prove without concrete evidence. Famous people can get away with it for years. While Adams apologized and addressed the NY Times article in a small series of tweets last Wednesday, he did not help his damage control by blocking people -- from Zach Lind of Jimmy Eat World to Jasun Lee of the FW Weekly -- for tweeting out scrutiny of him. Locally, I’ve seen the backlash quickly escalate. Respected musicians like Nicholas Altobelli and Vanessa Peters tweeted about their feelings about Adams not long after the article went live. Altobelli, in particular, is someone I remembered talking about how much he loved Adams’ output. As in, would drop serious cash own certain rare recordings. I don’t think getting to the point of saying “I’m done” was easy for any superfan, but it makes sense when there are allegations to the degree Adams has been accused of. Many rock stars have had stories of inappropriate behavior follow them around for years. From Chuck Berry to Led Zeppelin, take your pick. Though it’s common, it doesn’t mean that kind of stuff is permissible. I’m not one to burn up or throw away records by artists who have been accused of unethical or unspeakably horrible acts. But listening to them can be tainted to the point where I feel bad about or weary of something as small as streaming a song they get $.0346 cents for. There’s a break that forms between the listener and the artist. A tainting of an experience. When I look back at the person I was who listened to a lot of Ryan Adams albums, I think about how I had little or almost no social awareness about how I acted. Who would want to date someone who connected with a song like “Anybody Wanna Take Me Home”? Moreover, someone who was still bitter about things that happened years before and no lesson was learned? The hindsight makes things really clear now, but when you’re so full of yourself with your thoughts and feelings -- and not much time thinking about other people’s thoughts and feelings -- it’s easy to stay stuck under dark clouds. Who knows what will happen to Adams’ career, if there is a way it can recover for the immediate future. A planned new trilogy of albums has been put on hold, amongst the beginning stages of a serious legal inquiry. It’s bad buzz for him, and it seems like years of damage -- intentional or not -- have come back to haunt him. For me, the songs I used to listen to over and over serve now as reminders of how not to be. As in, you can’t pretend to be a victim when you’re the problem. If you want to keep blaming others and not own up to what you’ve done, well, you deserve to be alone. Buy it as an e-Book! Buy the book from Barnes & Noble! Buy the book from Amazon!